Where can I download instructions? The instructions should have also been included with your PowerPoint file via email. How do I use the Presenter View? Make your projector the second monitor. Then, set up PowerPoint to make use of the dual monitors. In older versions of PowerPoint, select Slide Show | Set Up Show. Then, under the Multiple Monitors section, select the appropriate monitor (your projector). In later versions of PowerPoint, select the “Slide Show” tab and make sure that “Use Presenter View” is selected. Open the slideshow and press F5. PowerPoint displays the slide on the projector. It displays the “Presenter View” on your laptop or desktop, which includes options for seeing a preview of the upcoming slides, the current slide, and the Notes field. The Notes field will include the Cue number. PowerPoint program also shows the slide number – this is NOT the Cue number from the score! Use the Cue number in the NOTES field! The cue numbers aren’t lining up! Make sure you are looking at the cue number in the Notes field and not the PowerPoint slide number. When slides get deleted or added or moved, the Notes field cue number will always match the score. This also allows you to add in cues if needed, such as splitting up a longer set of text into two slides without messing up the cue numbering system (such as Cue 46 and Cue 46.1 or Cue 46b). The Notes field is on the right side of the Presenter View screen just under the preview for the next slide. This can be confusing, so in updated versions of the slideshows “Cue” has been replaced with “Current Cue:” to help avoid confusion. What happens to the number system when I add or cut a slide? I’m ready to send the stuff back. What now? 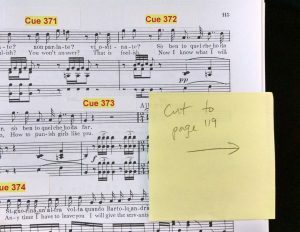 Assuming you followed directions, no markings should be in the score, only Post-It Notes. Take out the Post-It Notes (wasn’t that easy?) and simply mail the score back through a safe and insurable method. If you did not follow directions and you made pencil marks in the score, erase all pencil marks carefully and thoroughly, and without damaging the score. There can be no evidence at all that the score has been written in. Do not use the eraser on the back of a pencil! A full-sized proper gummy eraser, not just the one on the back of that pencil that has been sitting in your drawer for two years, is highly recommended. A proper eraser will damage the score much less, and will take you less time. Now, remove any binding material (paper clips, etc.) from the score and return it to Chadwick Creative Arts, 6 Nantucket Court, Medford NJ 08055 through a safe, traceable, insurable method . Scores returned with pencil marks and/or binding material are charged a minimum $100 damage fee for repair, regardless of how many or how few markings there are. Scores returned beyond re-use (such as scores written into with pen or trashed beyond the ability to be rented to others) will be returned to you and you will be responsible for the purchase price of the score (see your contract for details). How do I mark cuts? Use Post-It notes for all markings. Do not mark directly on the score. Do not use tape or any other adhesive which binds to paper. Do not write on or remove the cue number stickers. Do not write in cuts with hard pencil and indent the paper. Do not do anything that will risk the score being damaged. Do not mark in pen or marker, or you will be charged the full replacement fee listed in your contract. Please contact me using the web site’s Contact link or by calling me at 609-975-9766.